A week after the Art of Collaborative Leadership it is still hard to find the words to articulate the fullness of my experience in a succinct and coherent fashion, there were so many facets at play. This post will focus on three: crossing an intergenerational divide, hosting the energetic component of dynamic space and strategic results. When we looked around the room at the 22 of us gathered at Pottery Lane, a beautiful day retreat centre right on the Northwest Arm of Halifax, we noticed that there was a pretty even representation of younger and older people (older being mostly around my age, give or take a few years). In my own experience, this spontaneous even mix of generations has not happened before. The gatherings I’ve been part of have generally leaned in one direction or the other. This made the hosting team of myself, Jerry Nagel, Sophia Horwitz, Rachel Derrah, Ryan Deschamps and Marcello Lacroix (supported on the rim by Nancy Eagan and Martin Siesta) curious. We became aware that the composition of our group was directly related to the composition of the hosting and calling teams and I realized this was likely true of all the hosting teams I’d been on. As an example, in Brazil last October, the local callers and hosts were all young and the majority of people who showed up were young. In the future, I know I will be paying even more attention to the composition of the hosting and calling teams in relation to the purpose and intention we are calling in and the richness of the intergenerational exchange. The hosting team noticed early on in our three days that the energy in the group (showing up through individuals of course) seemed at times fiery, at times disenchanted, at times hopeful, at times curious – and most often all of those things at the same time. The energy seemed to be jumping all over the place – like soap bubbles floating in the air and popping. It caught our attention and we began to wonder just exactly what was in the air and how to hold the space with lightness, intentionality and discernment. In writing about it now it all sounds very professional, easy and sage. 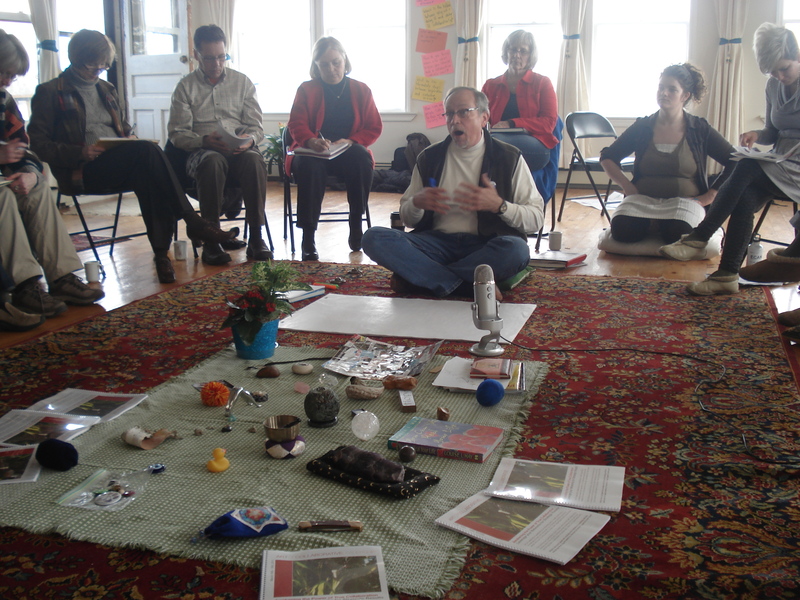 In the moment, it requires intense presence to tune into what is in the space without overreacting or pouncing on individuals who bring very diverse perspectives but allowing all of it to show up in the room, while at the same time deliberately inviting in the opportunities and space for people to practice new skills they are learning in the moment. A good reminder (if I needed it) about why it is important, even imperative, that we never host alone and that we create beautiful and strong relationships with our co-hosts so we feel fully supported and are able to observe the space from many different points of view and experiences. In our design of the three days, we had already decided to invite participants to go on a silent hour long walk after lunch on day 2. As we debriefed at the end of day 1 and talked about the energy in the room we needed to decide how far to delve into the energetic dynamics that were showing up so we could clear the air, wanting to balance it with our clearly stated purpose of learning more about collaborative leadership and the conditions that support it and carving out time for people to take projects and ideas they had walked in with to the next level of thinking and clarity. We decided we would take half of the hour long walk and invite a dyads conversation, asking people to share with each other where they were experiencing tension and where they were hopeful. We began to wonder if there was intergenerational tension in the room, so we further determined we would ask people to pair up with someone not in their age group. The invitation into this walk became a defining moment of our collective experience. As people were invited to pair up with someone not in their age group you could see the uncertainty as they looked around the room, wondering who on earth they were going to pair up with and who would do the inviting. It was a momentary collective holding of the breath, obvious to all and quickly surpassed. People walked and talked. And when we all arrived back into the room, something had clearly shifted. The energy had settled down and the room was even more ready for the learning that was to come. Intergenerational tension was not the only factor in the tension in the room but the dyad conversations became a leverage point for releasing various aspects of the tension. We moved into a proaction cafe in the afternoon and five ideas flowed into the space looking for a next level of clarity and wise action steps. Some people came with ideas just beginning to form and others came with critical issues they would be facing as they went back to work following this training. Some left with a beautiful level of precision on their work. At the end of this second day, when we were debriefing as a hosting team, we reflected on the waves and weave of the day. We knew we’d hit the summit of the experience and our last day was about arriving home well. We recognized that we still had a day we needed to enter with deliberateness and intentionality. The day was a mix of personal leadership and more tools, models and methodologies to help people frame their work and experience well. We brought in a compassionate listening exercise from Jerry’s work in Minnesota, taught the new model that Jerry, Chris Corrigan and others had evolved for resourceful communities and the two loops of systems change, and did a little methods cafe. We allowed time for people to wrap up any unfinished business with people in the room and moved to a beautiful closing circle. There was a greater hopefulness in the room than when we began, an excitement about results and, of course, a sadness in leaving. The hosting team has committed to calling this group back together on April 11 in Halifax. We want to continue to learn and grow from each other. People who live elsewhere are invited to participate from their locations. I am deeply curious about what more will emerge from this amazing little and powerful gathering. I am grateful to the hosting team for stepping so fully into this journey with me and have experienced new levels of depth in each of those relationships, individually and collectively. My world is forever transformed and expanded because of this gathering. My dear friend Marcello, who had committed to coming before we were even sure we were doing this, has had a lot of opportunity to reflect on this experience and a previous Art of Hosting experience as he prepares for the Art of Hosting training he is calling in Porto Alegre where he lives in Brazil in September – the subtle nuances, the dance with energy, the focus on results and the amazing power that can show up in well cared for and well tended spaces – because all of us cared for and tended the space. I would be remiss if I did not mention Roberto and Anke from Conscious Catering who were as much a part of our experience as the place we were in – preparing food lovingly for us. This is just a portion of my reflection from the Art of Collaborative Leadership. There is so much more, including the shifting shape of my own leadership learning experience from start to finish and beyond. Many more reflections to be sure from such a rich and enduring hosting experience.